In the second week of February 2018, I attended two conferences back-to-back, in different parts of the world, both speaking about the same subject – Global Mental Health – but in completely different languages. The first was the Movement for Global Mental Health Summit in Johannesburg (South Africa) themed ‘Leaving no one behind’. 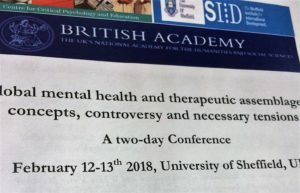 The second conference, in Sheffield (UK), was called ‘Global mental health and therapeutic assemblages: concepts, controversy and necessary tensions’ which, as the name suggests, was more critical of mainstream global mental health. 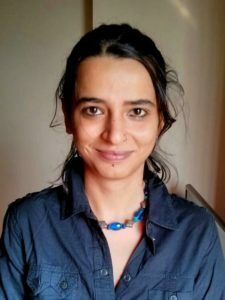 The interesting and sometimes uncomfortable conflict borne out of my position as an alumna of a Global Mental Health master’s programme and a current user-researcher (who finds herself largely critical of the subject she studied) was brought into sharp focus by this experience and gave rise to some difficult questions. Global mental health as a field was popularised on two pillars – evidence-based practice and a rights based approach – with the aim of providing mental healthcare in low-and-middle income countries where mental healthcare is not easily accessible. The Movement for Global Mental Health (MGMH) is a group of people and organisations that work to achieve that aim by producing research and evidence about cost-efficient mental health programmes and attempt to implement them in the Global South. These programmes often focus on availability of mental healthcare in primary health settings, access to medication, utilising lay persons to provide counselling and community psycho-education programmes. Parallel to this, there is a vocal group of academics and activists who are critical of the ideology and practice of global mental health. The most common critique has been focused on the de-politicised bio-medical framework utilised by the MGMH. In its bid to produce ‘evidence’, the rights-based approach has been reduced to a right to healthcare without examining the nature of that healthcare. Furthermore, critics argue that the MGMH operates as a form of psychiatric imperialism imposing a Western framework of understanding distress in the Global South. It is in the context of these arguments that I visited and examined the two conferences* based on the two sides of the field of global mental health. I entered the registration area of the MGMH Summit with some trepidation seeking out and finding several familiar faces. The Summit was an important one for my current project exploring user/survivor knowledges around the globe. It was the place for the launch of the Global Mental Health Peer Network. For the first time, a ‘person with lived experience’ was included on every panel. Surely, this was to be the moment when MGMH would rise to the challenge of its critics. This cautious optimism went down several notches as I went through the welcome pack. Among the usual notebooks, pens, and programme, lay a red pill box. Half-laughing, and half-outraged, I went through the magazine – Mental Health Matters – only to be confronted by 25 pages of pharmaceutical advertisements out of a 52 page magazine. To push away the rising scepticism, I went through the programme keeping an eye out for the ‘persons with lived experience’ on the panels. Much of the conference content was expected. Treatment gaps, lack of resources, scaling-up – buzzwords of global mental health. Interspersed within that were panel members who spoke of their experience of mental health problems and what that meant for their work. There was a confessional quality to these presentations, following a rather formulaic story: Illness, diagnosis, recovery, work. Some of the presenters who were not designated as ‘persons with lived experience’ also spoke about their struggles with mental health problems. To my cynical position, it smacked of ‘political correctness’ – being a user was in. At the closing of the Summit, a remark was made that, for the first time, it was not easy to differentiate the participants with lived experience and those without. I would disagree. None of the usual suspects – the most vocal critics – of global mental health were represented. (Had they been invited? Had they refused?). However, there were a few delegates in the audience questioning the mainstream global mental health discourse. Questions were raised, though some were left unanswered, about the medicalised nature of the mhGAP; the extent to which users were meaningfully involved in mental health programmes; and why the obsolete term ‘mental illness’ was favoured over the more inclusive ‘psychosocial disabilities’. Despite this disillusioning experience, a serendipitous conversation with a motley group of the MGMH leaders, users/survivors who are critical of global mental health and its activities, and funders provided a hopeful end to the conference. The central topic of conversation was a shared concern about the influence of the pharmaceutical industry. The repeated refrain was how both the proponents and the critics of global mental health lack an understanding of each other’s positions and thereby, create the biggest barrier to meaningful dialogue between the two sides. Feeling cautiously optimistic, I made the long journey from Johannesburg to Sheffield, UK. It really did seem like I had crossed over to a different hemisphere. Unlike the large nature of the Summit in Johannesburg, this conference was in a smaller church room with round tables set up for encouraging discussion and debate. Much to my surprise, there was no overlap between panellists, speakers, or delegates at the two conferences. This simple fact, perhaps more than anything, was telling of how far apart the two groups are. The conference content varied a bit and was more inclusive of the voices of users and survivors. Instead of only using the term ‘persons with lived experience’, the speakers and delegates used a diverse range of terms – users, survivors, persons with psychosocial disability. However, there was a disappointing lack of people from the ‘Global South’ where the MGMH operates. Might this be reflective of a flaw of the mainstream or the most visible critiques of global mental health? 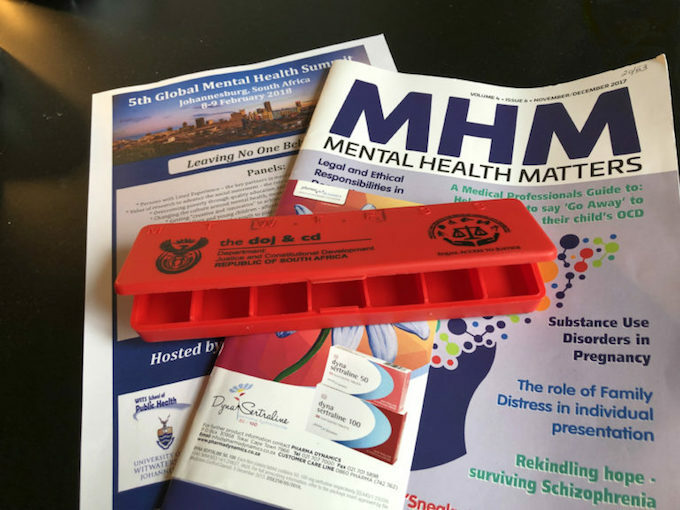 Was this ‘side’ guilty of what it accuses MGMH of –imposing a framework of resistance to global mental health which may not resonate with users, survivors, persons with psychosocial disabilities, and mad people in the Global South? There was no acknowledgement of or engagement with the perspectives of users and survivors who support (completely or partially) the activities of global mental health. There are parallels to this problem within the user/survivor movement – between the radicalists and the reformists as well as between those in the Global North and those in the Global South. A first step in stepping out of the echo chambers of our own creation would be to invite those we disagree with to share platforms such as conferences. A throwaway sentence about how several members from the MGMH have expressed and continue to express their concern with its activities in private conversations caught my attention. It was in stark contrast with the universalism implied by the incessant mentions of a singular ‘global mental health agenda’. Ultimately, it was this juxtaposition that wove the threads of my conversation in Johannesburg and my experience in Sheffield together. I, and others, personify the Movement for Global Mental Health speaking and writing as if it were one individual with one universal agenda. But the field, at least in theory, really is just a wide umbrella under which a wide variety of organisations and people operate. The structures and relationships between these organisations and people are largely informal. It would be naïve to pretend that power plays no role, and that there are democratic processes in place or that users/survivors have a position exceeding tokenistic ones. An inclusive rhetoric does not mean that processes are truly inclusive and the critical ‘side’ also needs to pay attention to and examine whose voices get privileged. The MGMH is not the omnipotent monster of our nightmares that we would like it to be. But it is here to stay. It is growing in influence and we can expect a great influx of funding in the next few years. It is not simply enough to protest outside its doors anymore, throwing rocks at this imagined monolithic structure. As the old passes into the new, there are moments of opportunities – in rushed conversations between panels, in the evenings after a conference day over a drink or dinner. In those moments, the large chasm between global mental health and its discontents can begin to be bridged. Even with the diametrically opposed positions we hold, there is common ground to be found. And building on that begins with the realisation that neither the field of global mental health nor its discontents are monolithic. It is no longer useful to speak of dark rooms with shadowy figures trying to diagnose and medicate the populace of the world all to the benefit of the pharmaceutical industry. It is not the pillbox and the magazine adverts telling me to ‘revive normality’ by taking drugs that are the focal point of my experience in Johannesburg. What I bring back are the concerned faces of some of the staunchest defenders of global mental health. What I bring back is their acknowledgement of the failure to adequately address some of the problems in the field they built—relegation of rights based discourse to the back-burner; lack of meaningful input from users/survivors; a blind eye towards pharmaceutical profit-mongering and funding. * The title of this post refers to a much-cited article by Doerte Bemme and Nicole D’souza which articulates some of the points of difference between the Movement for Global Mental Health and the critics of the field. Akriti Mehta began her journey towards user-led and survivor research with an academic background in mental health. However, her experiences of mental distress and mental health services as well as her interactions with other users and survivors led her to critically re-examine what ‘madness’ meant. She is currently working on a project (EURIKHA) which explores knowledge production by users, survivors, and persons with psychosocial disabilities. Akriti is interested in user movements in the ‘global south’ and how they influence, and are influenced by, local and global shifts including legal reform, Movement for Global Mental Health and cross-border user/survivor/psychosocial disability networks. Ableism- What has capitalism got to do with it?